The algorithm is based on the General Fuse algorithm (GFA). The result of GFA is all split parts of the Arguments. Adding the parts to result. To be taken into result the part must be IN for all shapes from the list <theLSToTake> and must be OUT of all shapes from the list <theLSToAvoid>. Add all split parts to result. Removing the parts from result. <theLSToAvoid> defines the arguments which parts should not be removed from result. Removes internal boundaries between cells with the same material. If the result contains the cells with same material but of different dimension the removal of internal boundaries between these cells will not be performed. Internal boundaries defined by the user. In other words the algorithm should provide the possibility for the user to add or remove any part to (from) result and remove any internal boundaries between parts. All the requirements of GFA for the DATA are inherited in this algorithm - The arguments could be of any type (dimension) and should be valid in terms of BRepCheck_Analyzer and BOPAlgo_ArgumentAnalyzer. The result of the algorithm is compound containing selected parts of the basic types (VERTEX, EDGE, FACE or SOLID). The default result is empty compound. It is possible to add any split part to the result by using the methods AddToRessult() and AddAllToResult(). It is also possible to remove any part from the result by using methods RemoveFromResult() and RemoveAllFromResult(). The method RemoveAllFromResult() is also suitable for clearing the result. To remove Internal boundaries it is necessary to set the same material to the parts between which the boundaries should be removed and call the method RemoveInternalBoundaries(). The material should not be equal to 0, as this is default material value. The boundaries between parts with this value will not be removed. One part cannot be added with the different materials. It is also possible to remove the boundaries during combining the result. To do this it is necessary to set the material for parts (not equal to 0) and set the flag bUpdate to TRUE. For the arguments of the types FACE or EDGE it is recommended to remove the boundaries in the end when the result is completely built. It will help to avoid self-intersections in the result. Note, that if the result contains the parts with same material but of different dimension the boundaries between such parts will not be removed. Currently, the removal of the internal boundaries between multi-dimensional shapes is not supported. It is possible to create typed Containers from the parts added to result by using method MakeContainers(). The type of the containers will depend on the type of the arguments: WIRES for EEDGE, SHELLS for FACES and COMPSOLIDS for SOLIDS. The result will be compound containing containers. Adding of the parts to such result will not update containers. The result compound will contain the containers and new added parts (of basic type). Removing of the parts from such result may affect some containers if the parts that should be removed is in container. In this case this container will be rebuilt without that part. The algorithm supports history information for basic types of the shapes - VERTEX, EDGE, FACE. This information available through the methods IsDeleted() and Modified(). 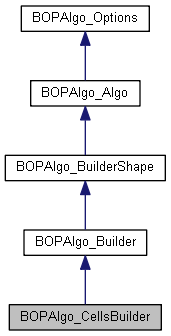 In DRAW Test Harness it is available through the same commands as for Boolean Operations (bmodified, bgenerated and bisdeleted). Error status acquired in the General Fuse algorithm. The Error status can be checked with HasErrors() method. If the Error status is not equal to zero, the result cannot be trustworthy. The Warning status can be checked with HasWarnings() method or printed with the DumpWarnings() method. If warnings are recorded, the result may be not as expected. /* defines the material common for the cells, i.e. the boundaries between cells with the same material will be removed. <theUpdate> parameter defines whether to remove boundaries now or not. To remove internal boundaries between any cells in the result <theMaterial> variable should be used. The boundaries between cells with the same material will be removed. Default value is 0. Thus, to remove any boundary the value of this variable should not be equal to 0. Redefined method Clear - clears the contents. Looking for the parts defined by two lists. Indexes the parts for quick access to the arguments. Prepare information for history support taking into account local modification map of unified elements - myMapModified. Makes the Containers of proper type from the parts added to result. Redefined method PerformInternal1 - makes all split parts, nullifies the result <myShape>, and index all parts. Remove all parts from result. To be removed from the result the part must be IN for all shapes from the list <theLSToTake> and must be OUT of all shapes from the list <theLSToAvoid>. In case of some errors during the removal the method will set the appropriate warning status - use GetReport() to access them. Returns TRUE if any internal boundaries have been removed. All split parts of the arguments. Connection map from all splits parts to the argument shapes from which they were created. Local modification map to track unification of the splits.